Within the boundaries of the Kosciuszko National Park you can find the snow fields of Thredbo, Perisher Blue Ski Resort and Charlotte Pass, while to the north is Mount Selwyn. The linked pistes found here, mainly on the eastern side of Mt Kosciuszko, make a splendiferous network of downhill runs. Set up as an easy way to get to the snow, Skitube is a train ride from Bullocks Flat to the Perisher Valley and Blue Cow Mountain. At the Skitube Train Terminal, you can park for free day and night in the patrolled carpark areas, making it ideal for day trippers. Bullocks Flat is below the snow line and is easily accessible for cars via the Alpine Way. This eliminates the need to carry chains and avoiding the busy narrow mountain roads during the winter ski season. Prices are reasonable, the train travels through one of the longest tunnels in Australia and passes through the Ramshead Range and into Kosciuszko National Park. The train ride is an attraction in itself. Phone +061 2 6456 2010 for more information. 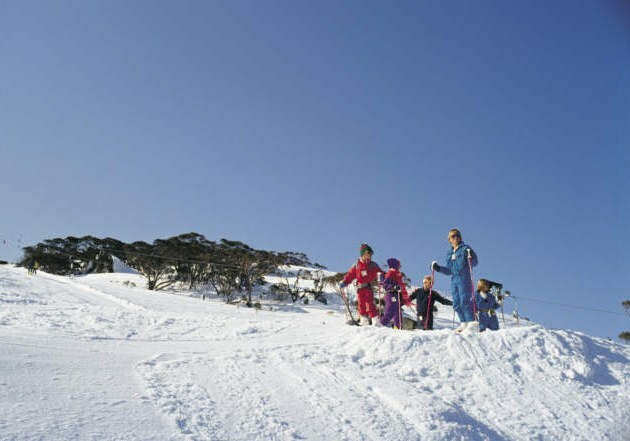 Perisher Blue Ski Resort encompasses the snowfields of Perisher Valley, Blue Cow Mountain, Guthega and Smiggen Holes. 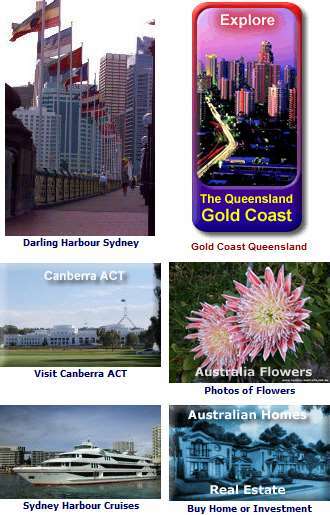 Here, there is cross country skiing and snowboarding areas with some of the best scenery found in Australia. 50 lifts with the longest run being approximately 3kms. Facilities include Ski and Snowboard parks, halfpipe and a snowtube park. While there is day-parking available within the Perisher carpark, overnight parking is not allowed. 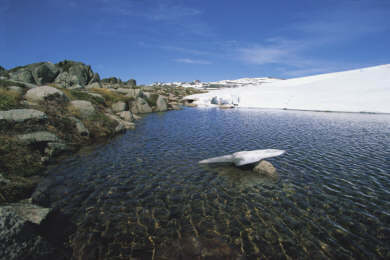 Thredbo, located along the Alpine Way is the twin to Perisher Blue Ski Resort. With its many chalets, windy streets and close-by restaurants, it attracts visitors the year round. In summer, you can take the chairlift at Thredbo over the Crackenback Range and hike the remainder 13kms to the top of Mount Kosciuszko. Take a hat and plenty of strong sun screen with you. The fishing is great, bushwalking and mountain biking here are popular activities. In winter, Thredbo comes into its own, ski-in, ski-out straight out of your hotel or lodge is available. The longest runs in Australia are here, up to 5.9kms, Thredbo covers 480 hectares of Ski and Snowboard terrain parks. The range of slopes here are suitable for beginners to advanced, as well as plenty of opportunities for snowboarding, even at night. You can get lessons here and join excursions, maybe even try a Snowshoeing Tour, experiencing the spectacular Alpine scenery. There are 14 lifts, while the highest elevation reaches 2037m. Nightlife for the snow revellers - Thredbo has a good collection of cafés, dining restaurants and bars. Charlotte Pass, the highest ski resort in the country has a number of shorter ski runs. Offering wonderful ski touring of the countryside, it must be noted the last 8km of the road to Charlotte Pass is closed after heavy snowfalls. During winter, take the Skitube to Perisher then snowcat up to Charlotte Pass. A day resort only, the gentle slopes here are ideal for families on a budget and beginner to medium level skiers. The longest run is 1.5kms. Selwyn Snowfields has a Snowtube park, toboggan only area and cross country. Located only 40 kms from Adaminaby, NSW. The highest elevation at the Selwyn Snowfield is 1614m, and there are 12 lifts operating there, between 8.30 am to 4.30 pm. Phone +061 2 6454 9488 for more information about the Selwyn Snowfields. Overnight accommodation is available at nearby Adaminaby and Talbingo. Take note of the Alpine Responsibility Code. You will see the signs around the Alpine areas, please read it and understand - it is there for your and others safety. The map shows National Parks, towns and places of interest, including Perisher Village, Thredbo village, Mount Kosciuszko and the Selwyn snowfields. 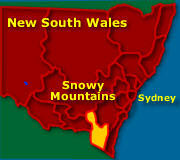 Map - See Map of the Snowy Mountains NSW Note: all vehicles, with the exception of 4WDs, must carry properly fitting chains with them at all times on the Snowy Mountains Highway. Not far from the Snowies: Canberra ACT. You can head from the Snowfields to the beautiful Sapphire Coast with its stunning beaches and National Parks in a matter of hours Sapphire Coast NSW.